Life in a Bubble – LIVE! Steve and his wife’s sisters move into a quaint house on Christmas Eve, completely oblivious to the fact that they have moved into the most dangerous place in the planet. Festive turns into Frantic as they desperately try to avoid their fate in a new comedy from the writer of Three’s a Crowd, Four’s a Mother! New Attitude Theatre Company is quickly making a name for themselves with their quirky comedies and plays. Now, they’ve come full circle to end the year with a festive offering based on a premise originally conceived and very well received at the One Play, One Day series. As Steve and Debbie settle in to their new house, the rest of Debbie’s family, including alcoholic Sharon and perma-tanned Denise turn up. It might just be the best Christmas ever! But as they settle down for the festive treats on telly, fate is about to deal them a very nasty hand. Simon Parker as Steve brings a brilliant naivety to the unfolding chaos around him as the hapless husband. His randy character is afforded some of the best one-liners in this comedy and is a great foil for the three girls. Kaylie Simon plays the bunny boiler wife Debbie perfectly with her character somehow managing to be completely irritating, but utterly adorable at the same time. Lowri Vivian brings some fire to proceedings as Denise, Steve’s bit on the side. Her tangoed appearance gives laughs enough, but her complete roasting of Steve will also be a source of laughter. Meanwhile, Jenny May’s Sharon steals the show as often as she swipes a drink off the table. Her chavtastic Sharon staggers into the show like a female Father Jack and provides much amusment. All the usual suspects are taken the mick out of in the affectionate script by Alasdair Jarvie: planning for Christmas with military precision; Christmas telly (including the now obligatory Doctor Who and Royle Family specials) and even the descent of family stretching civility to breaking point. Jarvie’s witty observations on real life are abundant here and casually fired out to the audience – you’re advised to listen closely for the best lines. The central twist of the comedy is actually quite clever, and the more astute of the audience might well guess at what is going on. I’m not going to spoil it, but suffice to say, I don’t think the Radio Times has ever been used as a dramatic device before! You’ll have a warm, funny and riotous time with this surreal family. Thankfully not stuffed with Christmas decorations, Life in a Bubble is a very well-crafted and splendidly performed warm-up for Christmas. Hate panto? Love this! 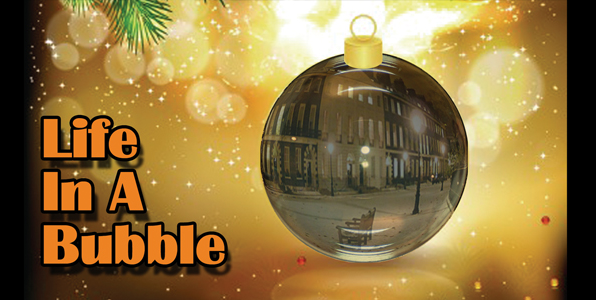 Life in a Bubble is on at Taurus Bar on 10/11 December and Sat 15 December. Tickets and more info are over on the New Attitude website.